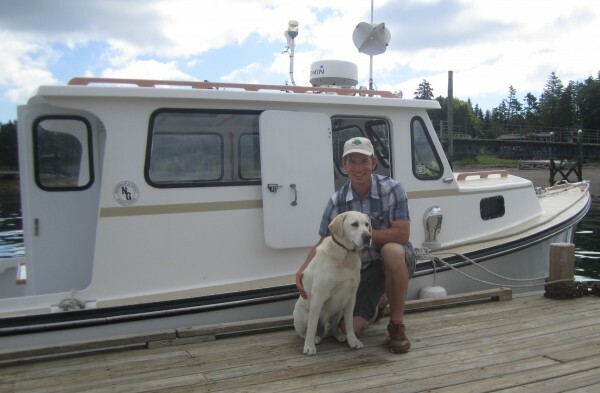 Josh Gray with his deckhand, Ozzie, sit in front the boat that Gray built for his water taxi business, a branch of the Newman and Gray boat building company. GREAT CRANBERRY ISLAND, Maine — Last Friday I hopped on a boat manned by Josh Gray and his deckhand, a 7-year-old lab named Ozzie. Gray is the captain of “The Cadillac,” a 26-foot water taxi with a lobster boat hull that he built three years ago at the Newman and Gray Boatyard. But water taxi captain is only a side job. Gray’s primary profession is building boats. When he takes over ownership of his father’s boatyard this summer at age 29, it will be the culmination of a roundabout journey which began and ended on the same small island off the coast of Maine. In the course of three generations, the Gray family thoroughly transplanted themselves onto Great Cranberry Island. Gray’s grandfather, a summer resident, moved to the island year-round after retirement. His son Ed, Josh Gray’s father, became a full-time resident in his 20s. Determined to make the island his home, Ed Gray bought a boatyard, started learning how to build boats, and settled down to raise his family. Although Josh Gray’s father had no boat-building experience when he first went into the business, he was a natural do-it-yourselfer. He did woodwork and metalwork. He raced motorcycles and rebuilt antique cars. That self-teaching model was part of a unique island education for Josh Gray and his four siblings, the first generation of Grays to be born and raised on Great Cranberry. In the 1980s, Gray attended grade school in Great Cranberry’s two-room, K-8 schoolhouse. There were about 12 students in the school. Teachers had two-year term limits, so the children saw a collection of different personalities. Such small numbers allowed for extensive field trips that involved the whole school. Students would travel to Washington, D.C., New York and Boston, sometimes for a week. Summer people who knew the islanders were generous, putting up the entire student body in their home city. But the small numbers made other things, such as sports, challenging. Gray was ready for a change in eighth grade, so he went to the bigger school in Northeast Harbor for a year, which prepared him for the next step. Strong believers in the value of education, Gray’s parents sent all of their kids to boarding school and college. Gray stayed in Maine for both. He attended Gould Academy in Bethel for high school, and then went to Colby College, where he double majored in economics and government. At that time, Gray did not envision a life back on Great Cranberry. After graduation, he moved to Washington, D.C., where he took an office job. But after six months, he’d had enough. Gray had been working with his hands most of his life, and began working at the boatyard when he was 14. The summer after high school, he built the boatyard dock with his sister. When Gray left D.C. and returned to work with his Dad, he became intrigued by the creativity and problem solving involved in the craft of boat building. In recent years Gray has taken on increasing responsibility at Newman and Gray Boatyard, so taking over as president this summer will not be a dramatic change. Part of what impressed me about Gray was the breadth of his enthusiasm. For starters, he shows genuine interest in all aspects of running a boatyard — the 70 boats they store every winter, the longstanding relationships with other tradespeople in the area, the new builds, restorations, rebuilds and custom designs. He also admires the beauty of a well-made boat, several of which he pointed out to me as we went in and out of harbors. But the scope of Gray’s appreciation goes even further — it encompasses both the traditions of boat building and the newest technologies. He is as enthusiastic about the benefits of email for design discussions with customers as he is about the fact that he still services the first boat that his father built on a hull made by his former partner Jarvis Newman. That boat is more than 25 years old. Gray’s education and experience, both on and off Great Cranberry Island, led him to discover his inclination to integrate tradition and progress, to work with both his brain and his hands, and to just “figure stuff out.” If the success of the Newman and Gray boatyard is any indication, he is making a pretty fine job of it. Robin Clifford Wood welcomes feedback at robin.everyday@gmail.com.